Let’s face it: Meniscus has been around for an eternity, at least when it comes to the world of ‘zines. Twelve years, to be exact. After a number of fits and starts, Meniscus has crossed over into the new millennium with a gradual shift from its photocopied print roots to a rapidly evolving Web site. The world of e-zines has been noted by some zinesters as strangely foreign, prompting automatic responses of hesitation and unease. 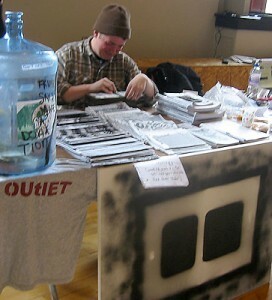 Those two feelings certainly preceded Meniscus’s final appearance at a ‘zine convention at the 2006 Boston Zine Fair. Had this ‘zine turned to the “dark side” by shifting from hard copy to virtual copy? Would the reception be different than at previous events like the 1997 Zine Fiends Festival in Seattle, or the 2004 New Jersey and Philadelphia Zine Fests now that this cyber crossover had been made? Those anxieties rapidly dissipated once the fair got under way at the Massachusetts College of Art’s Pozen Center. The last turn for Meniscus was a return to its ‘90s roots, and a reminder of why ‘zining is still such a powerful medium following the birth and blowout of the blog. New readers stopped by to check out the Web site and purchase hard-copy issues that are now treasured bullets in the Meniscus timeline. Others signed up for the Meniscus e-mail list, while the familiar questions of, “What is a meniscus?” and “What do you write about?” were sprinkled amidst broken-record branding messages of why Meniscus exists. But while a ‘zine fair can result in a purchase – or Web site click – here or there, it’s the unbridled enthusiasm and conservations about ‘zining that, at times, supersedes the publications themselves. The people are what make the event: the zinester/freestyle rapper who practices Eastern medicine and martial arts. The high school teacher from New Mexico who was able to make the weekend a research business trip for her ‘zine making class in Las Cruces (lucky her!). The aspiring writer who wanted a chance to get published but had never fully explored that artistic avenue. Chinese Sweatshop: The publications under the Chinese Sweatshop umbrella are, to put it in a phrase, works of art. Elsie Sampson, a Hong Kong native transplanted in Westchester County, N.Y., sprinkles autobiographical anecdotes amongst ‘zines that double as personal scrapbooks. 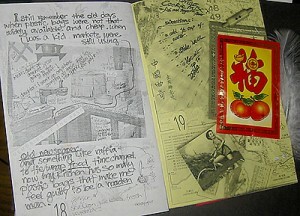 Chinese Sweatshop, her main publication, includes a hodge-podge of offerings ranging from childhood stories to recipes to reminiscing about family gatherings. Offered in “simplified” and “artist” versions, the latter is a limited-edition format where the strength of Elsie’s ‘zines – their presentation – shines. “Lai see” (lucky red Chinese New Year’s envelopes), matches, miniature pencils and other delightful trinkets are pasted onto pages; I literally had to take care not to disturb these elements as I lightly turned the pages of issue #4. Elsie also publishes one-off ‘zines with themes ranging from food to Halloween to candle-making. Prices range from US$1 to $15 + shipping and handling. For ordering information, go to www.chinesesweatshop.com. Haters Magazine: It was clear that the guys from at Haters Magazine meant business as soon as they hung up their intimidating banner. The Haters trio of two African Americans and a Caucasian not only publish ‘zines, but they produce hip-hop CDs, a clothing line and a Web site (www.contextflexed.com). The no-holds-barred site includes first-person rants spanning a number of topics; those flinching at blunt opinion need not apply. As for the banner? The longer I stared at the phrase, “The magazine you wish you had started,” the more I wished that I had started it. Keene Free Comics: Plucked out of a sea of unassuming options on the freebie table, this ‘zine features eight pages of short comic strips that are simultaneously cute, ridiculous and hilarious. 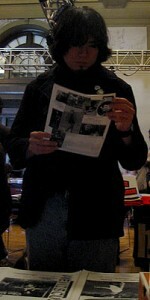 The ‘zine, based out of Winchester, N.H., also features an “Awe-Inspiring Comics Advice Column.” For more information, go to www.colintedford.com. Yankee Girl Designs: Since ‘zine fairs attract creative folk, it’s no surprise that some booths go beyond the written word and into more artistic pursuits. One case in point is Yankee Girl Designs, a jewelry line from New Hampshire. Lindsey, a children’s librarian by day, searches for fun pendants and charms to make playful pieces, including plastic doughnut bobby pins, and necklaces with miniature pennies and bird nests. Best of all, most of her pieces are not mass-produced, so a wearer can brag to her friends, “I own it, AND it’s the only one in existence!” To browse the online catalog, go to www.lindseyandray.com/ygd.